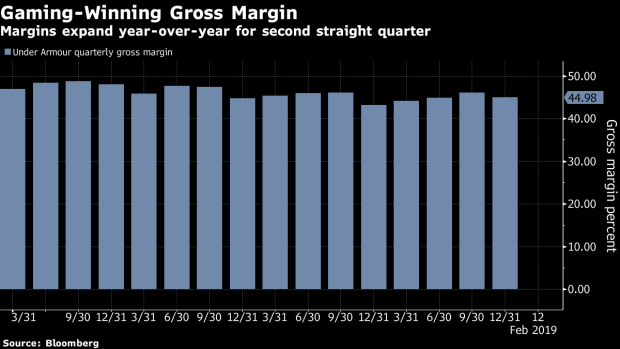 (Bloomberg) -- Under Armour Inc.’s fourth-quarter results and forecasts initially started a tug-of-war in pre-market trading, and a stock decline of as much as 5 percent in early trading before more bullish heads prevailed. Investors appeared to take comfort in the improved gross margin and maintained year forecast, and Piper Jaffray noted that investors were probably prepared for a weak first-quarter guide. Cost controls, clean inventories and lower promotional activity were also noted as positives. Shares rose as much as 8.5 percent, the biggest intraday gain since Oct. 30, to $22.55. Short interest is at a 52-week low of about 22 percent of float, according to Markit data. Stifel analyst Jim Duffy, who rates shares buy (price target $30), expects to see a “wave of bear capitulation as the year unfolds” given solid execution and the company’s capacity for gross margin expansion.